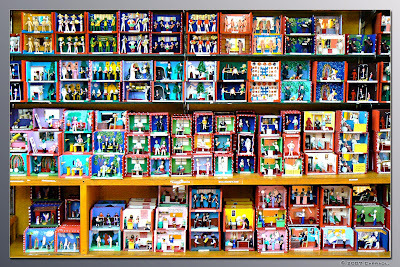 A nice shop located in the Zona Rosa (Pink Zone) a kind of bohemian area visited by tourists, business man or just for fun, where you can buy all kind of lead miniatures, some of them are very artistic pieces, no more than 3 inches tall, like this "ofrendas" (offerings) for gift. How lovely! Reminds me of some miniature "oratórios" (oratory)sold here too. The details are perfect! BTW, great link about the bondinho! I didn´t know Rio´s sky had been elected the most perfect blue, actually, I would never imagine there was such a thing as this kind od study. Some people will research anything! What a brilliant pic, Carraol!Really colorful!! I love it! Sobre lo de la lista... hay una entrada en el foro, aquí te pongo el link. Ahí se explica como poner esta lista en el blog, lo que no sé es dónde hay que inscribirse o a quién hay que decírselo para que te añadan. Monica, Dsole, thank you for visiting & Dsole thanks again for the link.